Albion House is a three-storey Georgian property which has been stylishly refurbished resulting in a cool, contemporary holiday home for up to 9 people. This is a perfect place to stay in the heart of Burnham Market one minutes walk from the village green and the renowned "Hoste Arms", with the advantage of off-street parking for 2 cars and a private courtyard garden. This uniquely designed house with a classic/modern twist is a super place for families and friends to socialise with a smart ground floor sitting room and a relaxed top floor "den" with a large plasma TV & Wii. The stunning Norfolk coast is only 5 minutes drive away with its endless unspoilt sandy beaches. Outside peak school holiday periods, the house may be rented at reduced rates without the top floor bedrooms. Entrance hall: with an oak floor, contemporary wall lights and a console table. Utility Area: Useful area with coats and boots storage, washing machine, tumble dryer, microwave and a freezer. There's a door leading to the back garden. Shower Room: contemporary walk-in shower, hand basin, WC and heated towel rail. Kitchen: retro style kitchen at the back of the house with French doors opening onto the courtyard garden. Well-equipped with a Smeg fridge, electric oven, halogen hob and a dishwasher. There is a dining table with 8 chairs and a Bose ipod dock. 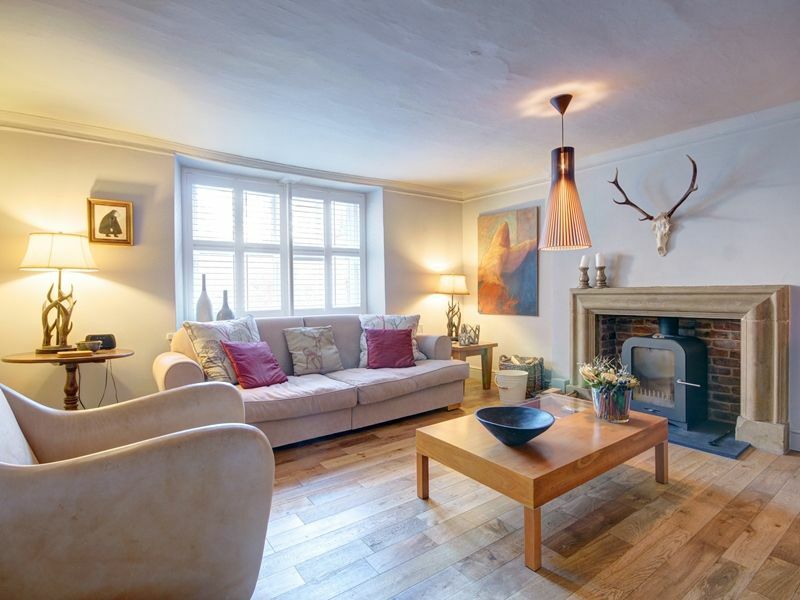 Sitting Room: Stylish room with an oak floor, wooden shutters on the windows, contemporary wood-burning stove and two large comfortable sofas and Matthew Hilton designer keather armchair. There's a flat screen freeview TV with DVD player and a selection of books and DVDs. There's the advantage of Wifi which works throughout the house. Bedroom 1: Beautifully presented "boutique hotel style" large room with a king-size bed, bedside tables and lamps, wardrobe and tallboy. There are window shutters, a bench seat and an original fireplace (ornamental). Bedroom 2: Another beautifully presented large room with a double bed, bedside tables and lamps, wardrobe, tallboy and an original fireplace (ornamental). Bathroom: Contemporary room which is fully tiled in travertine marble. There is a bath with shower mixer attachment, hand basin, WC and heated towel rail. Bedroom 3: Decorated in a nautical style with full-size bunk beds, walk-in cupboard. Bedroom 4 / Den: Spacious room with a high pitched ceiling which has been designed as the ultimate chill-out room with a large plasma TV with surround sound, DVD player, Wii, beanbags, and a good selection of board games, DVDs and Wii games. There are two single beds, bedside lamps and clothes storage, making this perfect for adults, teenagers and children. Bedroom 5: Small room with a single bed, bedside light and tall boy. Access is via a shingle drive to the rear of the house through high solid gates. Cars may be parked in the courtyard area at the rear, or parked on the road at the front of the house. The courtyard garden is part fenced and part walled and is fully enclosed. There is outside furniture.